Around 200 University of Michigan and Ann Arbor community members gathered in Weill Hall this past Presidents’ Day for a continuation of the Conversations Across Difference speaker series. This iteration, titled “Voices from Across the Aisle,” moderated by Professor Brendan Nyhan, featured U.S. 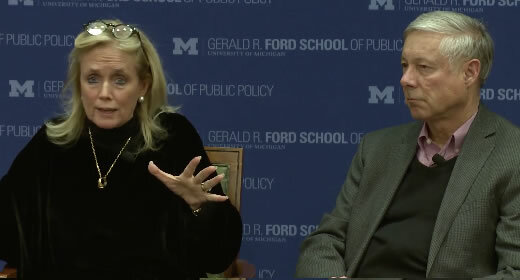 Representatives Debbie Dingell and Fred Upton discussing candidly the necessity of bipartisan politics. The event was covered in Michigan Radio, MLive, Click on Detroit, and The Michigan Daily.